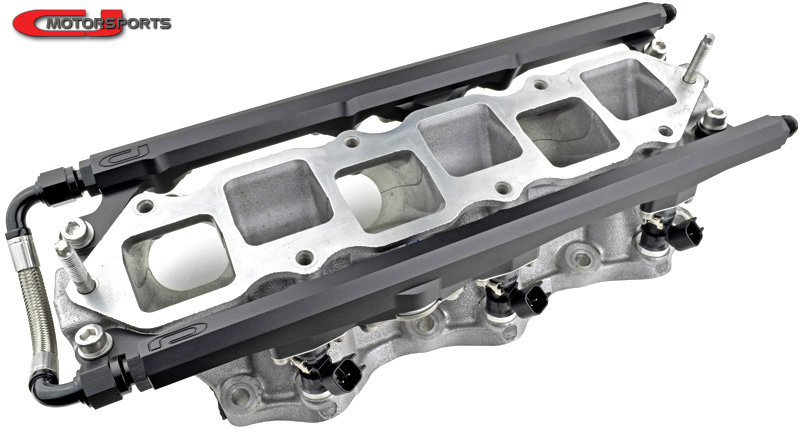 The S1 VQ35HR fuel system builds on the S0 system by introducing our billet aluminum fuel rails and additional engine bay plumbing. Starting with a 6AN QD adapter for the fuel feed pipe, a 6AN hose feeds fuel into the rear of the RH fuel rail. The rails are joined in the front with a short 6AN crossover hose and fuel leaves the rear of the LH rail leading to the adjustable regulator. From this point back, it matches the S0 system with a 6AN return line leading back to the fuel tank and a return correction kit for the fuel pump housing. 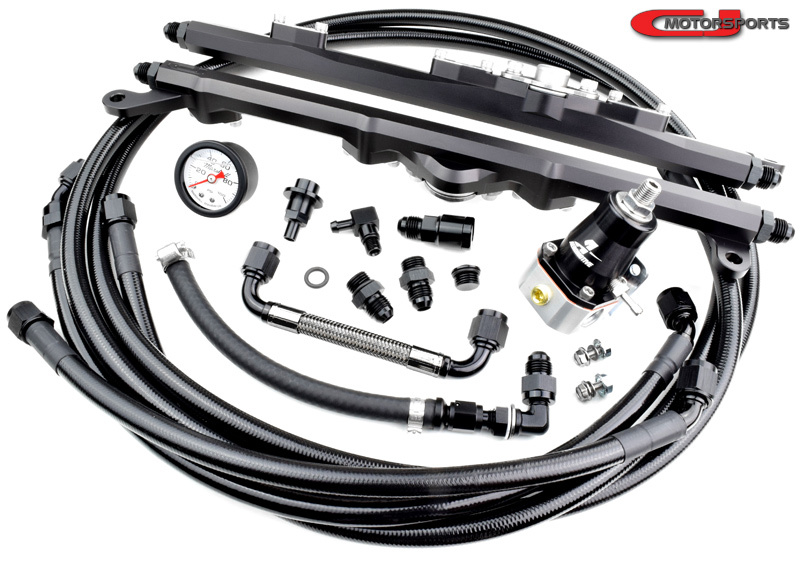 This is our most popular current HR fuel system. The series style plumbing (one rail leads to the other) is a clean approach and, with appropriate fuel injector and pump upgrades, it is suitable for use at power output levels up to, and exceeding, the factory HR short block. As with all our fuel systems, the hoses are constructed from SS Braided PTFE. Most the hoses have a black PVC coating to protect your chassis or neighboring components from the abrasion of stainless braiding. Intake Manifold and Fuel Injectors not included. Contact us before ordering for a Sedan. Pulsation Dampers: For this application we would highly recommend a pulsation damper in each fuel rail. 6AN PTFE Hose, Black Coated SS Braid, Pipe to RH Fuel Rail. 6AN PTFE Hose, Black Coated SS Braid, LH Fuel Rail to Regulator. Fuel Injectors: Complete the package with a set of fuel injectors. We recommend 1050cc injectors for all boosted VQ35HR applications under 700whp.